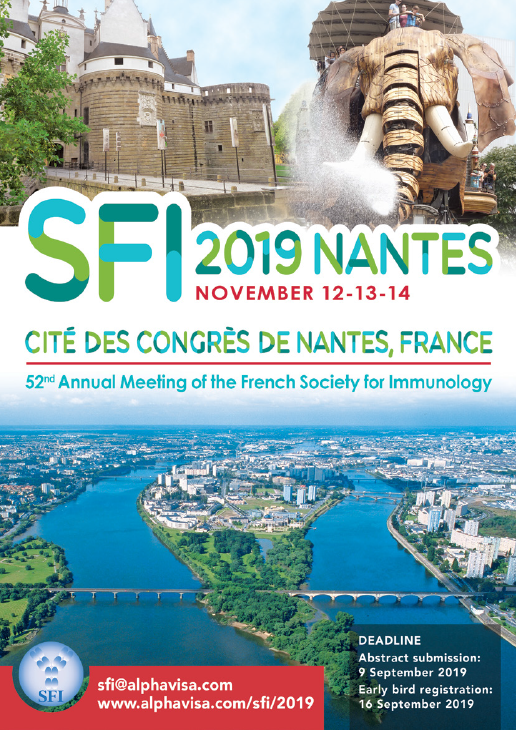 We are pleased to invite you to the Annual Meeting of the French Society for Immunology that will be held in Nantes from 12 to 14 November 2019. The venue of the meeting will be La Cité-Nantes Events Center, closely located to the historic city center. The meeting will be composed of 6 plenary sessions dealing with diverse themes of present and future immunology: Systems Immunology, Immunoregulation, Cancer Immunology, Innate Immunity, Immunometabolism and interactions between the Microbiote and the Immune System. It will furthermore include fifteen parallel sessions, in addition to workshops of existing and recently created Clubs of the French Society for Immunology: Germinal Centers Club, NeuroImmunology Club and Mast Cell/Basophil Club. A joint session has been scheduled with the German Society for Immunology (DGfI). 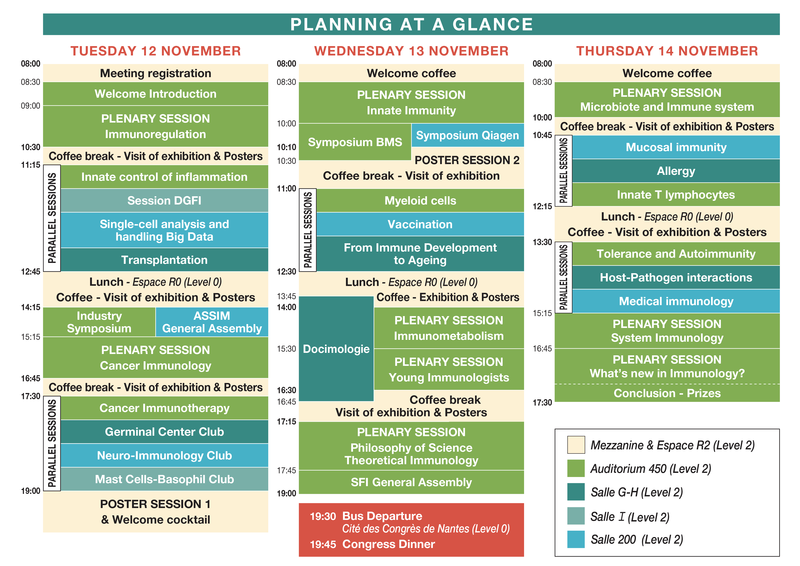 A special session emphasizing medical immunology has been organized at the end of the meeting, followed by the Journée de la Fédération d’Immunologie on 15 November. The involvement of young researchers in the organization of and participation in the meeting has been strongly encouraged. In addition, a plenary Young Immunologists session will enable promising young students and postdoctoral fellows to present their work whereas each session featuring oral communications selected from abstracts will be co-chaired by young immunologists. Finally, prizes for the best oral and poster presentations will be awarded at the end of the meeting. Nantes is home to the castle of the Ducs de Bretagne and has several historic districts within its city limits, as well as an important cultural heritage, including the presence of theater companies like Royal Deluxe and Les Machines de l’Ile. We encourage you to participate actively in this annual meeting by submitting abstracts for oral and poster presentations.